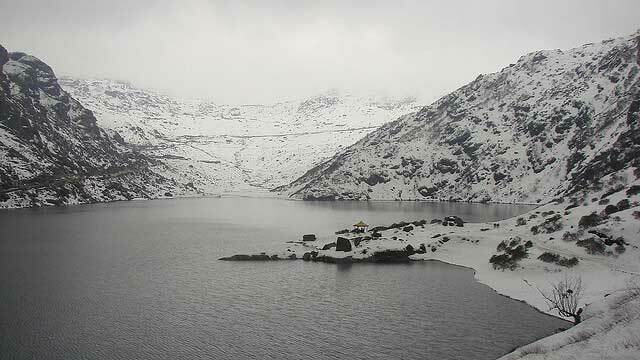 Tsango or Changu Lake, is located on the north of the Nathu la pass, and is a glacial lake in Sikkim. The lake is situated at an average elevation of 3.780 meters above sea level. It falls in the restricted area and hence an inner line permit is required by Indians to visit this place. Foreign nationals are not permitted to visit this lake without special permission. The lake is about 1 km. Long, oval in shape, 15 meters deep and is considered sacred by the local people. It is also a home of brahminy ducks. It’s cool, placid water harmonizes with the scenic beauty around. Changu Lake is shrouded in myths and legends. It is said that in ancient times, the Lamas (Buddhist Saints) used to predict the future by observing the lake’s colour. If the water of the lake had a dark tinge, they predicted the future to be dark and gloomy, full of unrest. The faith-healers of Sikkim, popularly known as Jhakhris also visit this lake during Guru Purnima to offer prayers. But humans are not the only visitors to this lake. A small temple of lord Siva is constructed on the lakeside. This placid lake remains frozen during the winter months up to mid-May. Between May and August it is possible to see a variety of flowers in blooms, including the rhododendrons, various species of primulas, blue and yellow poppies, irises etc. It is also an ideal habitat for the red panda and various species of birds. The Chinese border crossing is only some 5 kilometres (3.1 mi) east-northeast in a straight line, but some 18 kilometres (11 mi) by road.